I thought I’d share this week’s progress, particularly since it includes a sewing project. Wednesday seems to have come around very suddenly this week. Luckily I’ve had quite a bit of craft time as MrCraft has been working overtime so I’ve had some empty evenings. 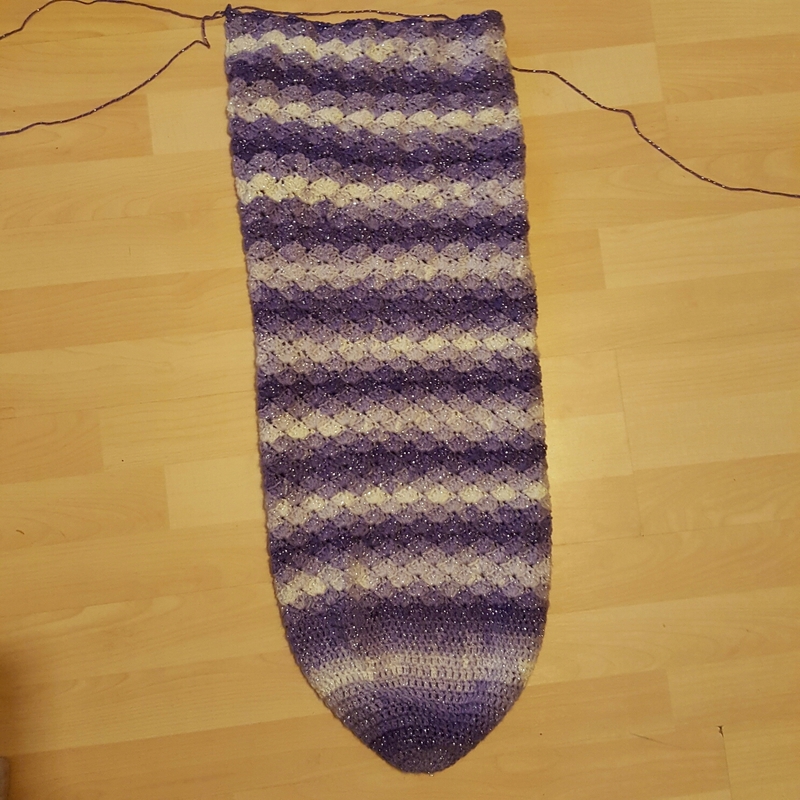 The mermaid tail I started last week is coming on well, there are only around 20 rows to go and then I can begin working on the fin. I’ve also been taking time to work on the advent calendar which I introduced in Christmas craft is stepping up a gear. 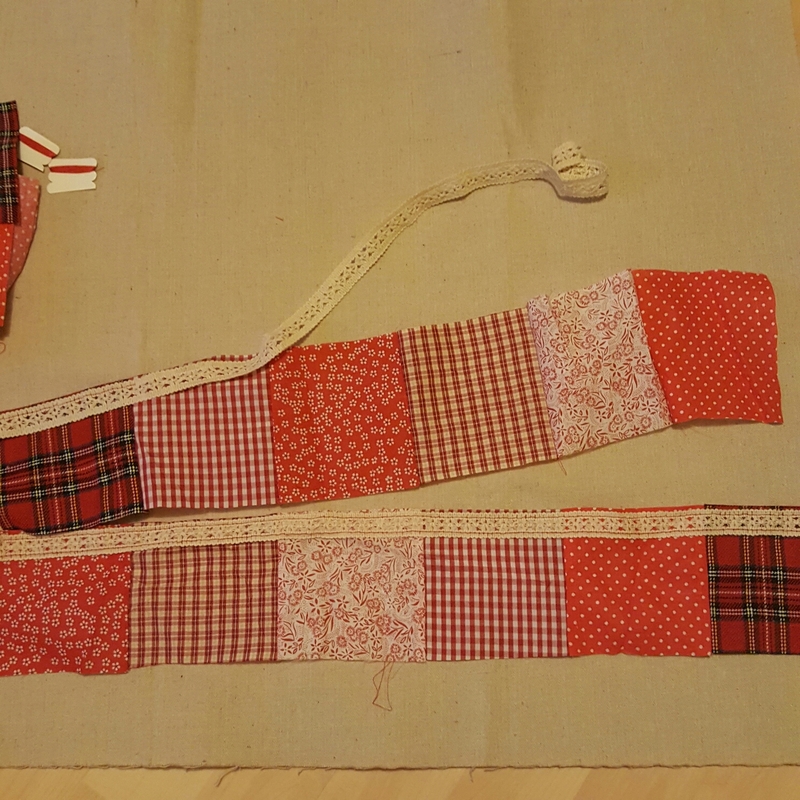 I’ve made 2 rows of pockets and been sewing on the trim. Hand sewing is surprisingly time consuming but once the mermaid tails are finished and posted to their new homes I can begin to devote more time to it. I’ve also been working on something just for me but I will take a photo of it in better light. I’m not so keen on these dark evenings as I relied on natural light for taking my blog photos. I’ll have to rig something up for the winter, or just stop adding photos! Your projects look great! The photo-taking in diminishing light seems to be an issue for a lot of us. I think we maybe need British Craft Time instead of British Summer Time! It’s the silly yellow light in the living room, I’m sure I could do some editing but it wouldn’t be the same. The conservatory is far better for photography! I’m looking in to setting up a light box for small items though, DIY obviously! Yes, I just like that early evening light, so no flash needed but the colours really pop. Won’t work for winter though so a DIY light box is also on my to do list. That’s when I like to take mine too. I forgot to do any this afternoon though so had to make do with rubbish ones. I didn’t see ‘rubbish’ photos! please keep us fans updated on your progress! Both projects are just lovely! Ooooooooooooooh the colours of the mermaid tail are lovely! What yarn are you using? I am working on a poncho atm. It’s corner to corner and I am now past the half way point so hopefully I will finish soon. I am also working on a chunky shawl/scarf thing. I am hoping to finish that tomorrow as I need the bag it’s in to transport a new project with me on a weekend to Manchester this weekend! Sounds like you’ve got a few fab projects on the go. The yarn is ice yarns magic glitz, it’s surprisingly soft even with the metallic thread. I will have to have a search for it. I do love a bit of purple and glitz! Lots of lovely crafting going on for you 😃. I’m cross stitching at the moment but my purple knitted blanket is shouting for some attention from its summer hibernation. It’ll be nice to sit under it while knitting some more so I must get back to it. 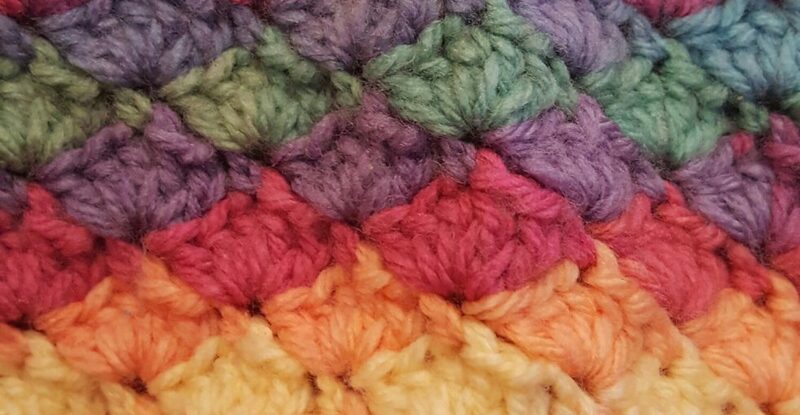 Beautiful – love the stitch pattern! I adore the stitch you’ve used for the tail. I can’t let my small girl see that or she will demand a replica. I’m still plodding along on my Mrs Weasley jumper. Teenage daughter wants it for Halloween but there’s not a hope! It’s still drying but I will put it on display soon! Harry Potter maniacs in this house!